A humpback whale 11 meters long was found dead in the jungle , far from its natural habitat . 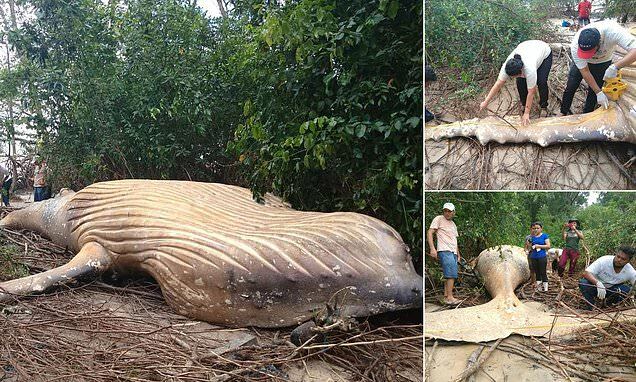 Last Friday 22, a humpback whale was found dead in the middle of the undergrowth of the forest of Pará , a Brazilian municipality located on the island of Marajó , at the mouth of the Amazon River . It was reportedly a humpbackor gubarte , also called a humpback whale, approximately 11 meters long and 6 meters wide, whose natural habitat would be the saltwater ocean. As a result, the Municipal Secretariat of Health, Sanitation and Environment [Semma] has been carrying out an investigation to determine why the marine animal was far from its natural habitat and in the winter season. Biologists from the NGO Bicho D’agua were also present at the site, who pointed out that at first sight the immense animal had no visible wounds, so an autopsy is required to determine the cause of death. Humpback whales are fed seasonally, it is possible that not finding food will migrate to the beach and swallowing large amounts of water will suffocate with plastics, being later his body pushed by the waves of the sea into the jungle.